Months ago I saw this quote here and absolutely loved it. 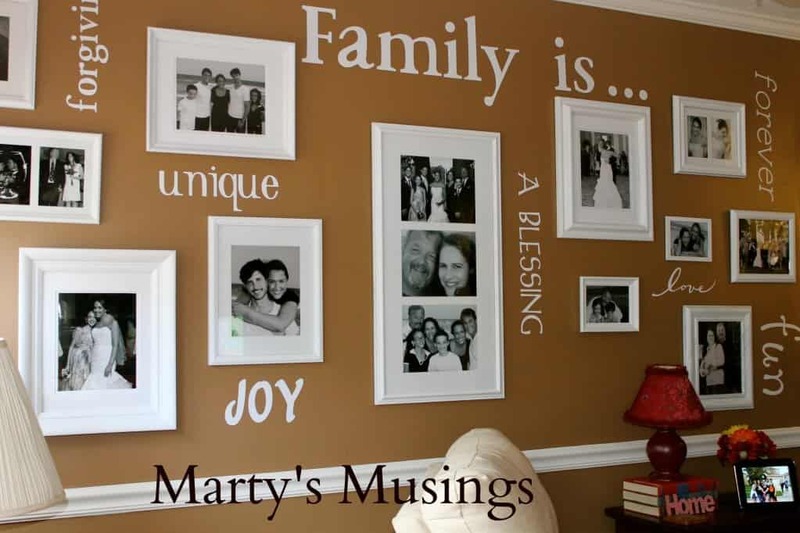 I decided I wanted to put it in my scrapbook room (picture below) because it accompanies the idea of telling our stories through written word. It took me a while to build up my courage to use my Cricut and figure out what font and size I wanted to make it. Around early December I cut the vinyl and then taped it on the wall but didn’t like the arrangement. I gave up on it because we were in the middle of other major projects. Tonight I tried it again. Instead of putting the quote in four lines I did it in one straight line across the wall. My husband again used his handy dandy laser level to keep the lettering straight. My own problem this time around was the transfer tape was difficult at times to peel off the back of the vinyl. Note to self: don’t procrastinate for four months after cutting the vinyl! Here I used masking tape to temporarily position the words. I used the Plantin font (size 3″) for all the words except Life. For that I used the Lyrical font (10 1/2″), loop dee loo setting. Here’s part of the quote. So far so good. 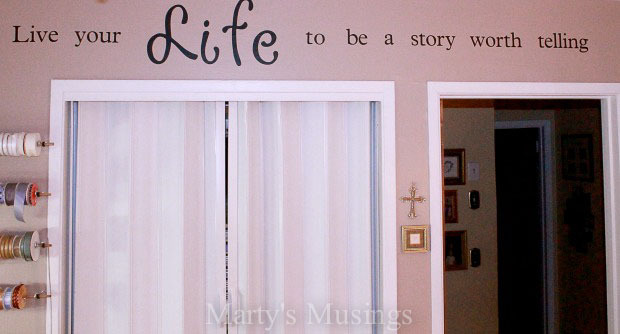 And here’s the entire quote above the closet in my scrapbook room. I absolutely love the way it turned out! If you haven’t seen my gallery wall please visit and tell me what you think. It was my first real project using my Cricut. Just bought a Cricut on Craigslist a month or so ago. Have been thinking about the vinyl lettering option. You inspire me. Wish we lived close enough to share Cricut cartridges. I need a Cricut friend. Love the quote and the idea! I wanted to do something like this in my daughters room. Great job! Hey there!! I just added myself to your followers for support, and wanted to invite you to check out an awesome Modcloth giveaway I’m having! Great job! Thanks for linking up today!